Taurus zodiac sign are very sensual by nature. They are also very sentimental and possessive. These personality traits mean that dating a Taurus tends to get very intense very quickly. Taurus personality value steady friendships over casual ones as they are happiest when they are part of a couple. If you decide to date a Taurean, you need to be as serious as they are because they do not appreciate people who play games with their feelings. The Bulls value home, family and stability and are happiest when they are in a serious relationship. 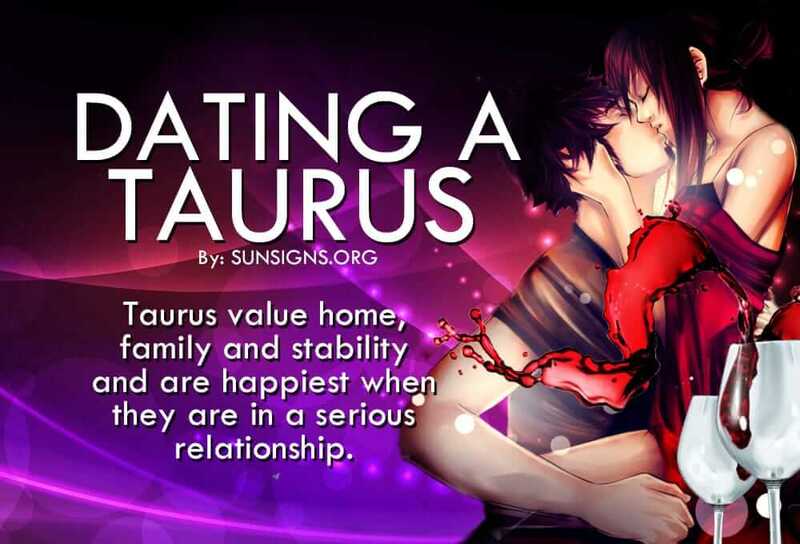 Home is a Taurus’ happy place and they want to share it with someone they love. As much as they value relationships, Taurus men and women do not like to rush into things. It takes the typical Taurus in a relationship, a long time to open up and admit their feelings. This can be off-putting to many potential partners thus leading to a breakup. If you hang in there though, you will find that a Taurus makes a great lover, one who is dependable and steady, but also sexually passionate and exciting in bed. If you can get through their emotional barriers, you can find great happiness with a Taurus as a lover. Taurus men may have a hard time putting their feelings into words, preferring to let their actions speak for them instead. A Taurus man will try to show his affection for his partner by doing little things for them. When dating a Taurus man, romantic gestures are common, long conversations about his feelings are not. Taurus men in love can be very possessive of their partners and can be prone to jealousy, which can be difficult to live with. They can also have funny ideas about a relationship works. With a Taurus male, it is often best to let him do the courting. No one does romantic displays better than a Taurus. Taurus women are very strong, but more emotional than their male counterparts. A Taurus woman personality may be very conventional and long for marriage and children and a stable life. She will often go into a relationship with long-term goals in mind, as she is interested in serious companionship not a temporary romance. Taurus females are homebodies by nature and tend to be very domestic and a natural homemaker. They like to care for their partner and lavish him or her with attention and care. While Taurus women are happiest at home, they still appreciate the fine things in life. The best way to win a Taurus woman is to woo her. A good way to make an impression on a Taurus lady is to treat her to a first date at a nice restaurant. If you are successful at winning her heart and you treat her the way she deserves, you will find that a Taurus woman makes for a loving and devoted partner. Taurus love compatibility is best with other Earth signs or with complimentary water star signs. The best love matches are Taurus Virgo and Taurus Capricorn. These relationships are very stable and nurturing, though they can lack emotional intensity. Taurus Scorpio pair soul mates are also compatible though this pairing can be very intense due to Taurus’ possessiveness and Scorpio’s moodiness, however the sexual chemistry can be amazing and this pairing can achieve an incredible emotional intimacy. Taurus’ tend to conflict with Fire and Air signs because of core personality differences. The worst matches for a Taurus come from these two elements. Taurus’ do not tend to do well with the equally strong-minded, but more aggressive Aries (Taurus Aries). Practical, home-body Taurus’ also do not mate well with free-spirited Sagittarians (Taurus Sagittarius) or restless, fickle Geminis (Taurus Gemini).